On behalf of the Buddhist Peace Fellowship here in the U.S., I send our warmest wishes to Ajarn Sulak on his 80th birthday. 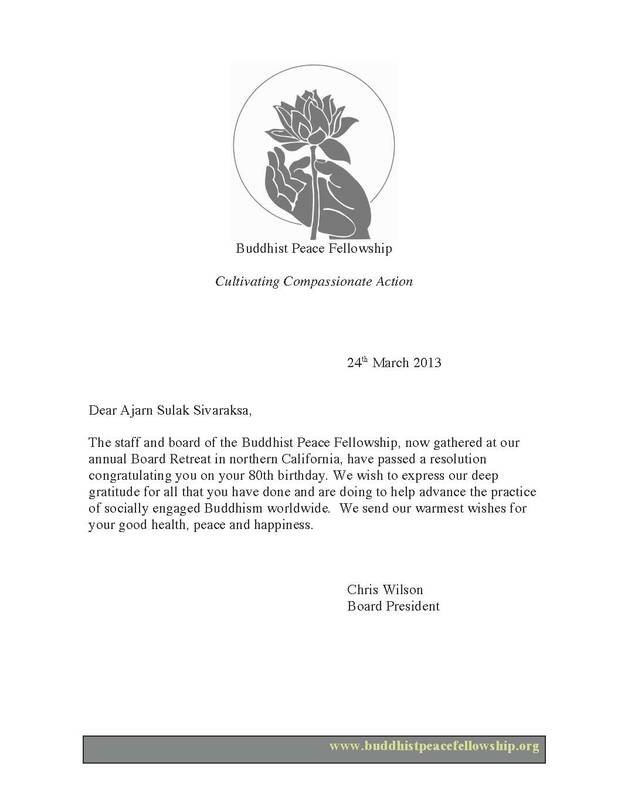 For decades, Ajarn has been a true kalyanamitra to many of us as we walk on the path of socially engaged buddhist work. We are thankful for Ajarn’s wisdom, courage, and kindness that we have received through personal connections, his prolific writing and inspiring work. May Ajarn be blessed with good health, joy and happiness always. And may no harms come to you so that you can spend the next few decades without worries :-). FYI: On the eve of Ajarn’s 80th birthday, he still did not stop making waves. And this time, it might actually be a reallly Big One! Ajarn made history with his appearance on Thai PBS (public television) a few days ago, debating with another academic about the monarchy and its survival. This is the FIRST time in Thai history that such a dialog was broadcasted on television. The program ignited fear and hatred in many people and institutions, who viewed the show as dangerous and threatening to the nation. It is my hope that this will eventually lead to a positive change in how we deal with differences in opinions, politics, etc. I am sorry I won’t be able to attend the event in Bangkok. Hoping to see photos or video from the celebration later :-). It is such a joy and honor to be a part of the celebration events for your eightieth birthday. Bound by my heavy duties here in Taiwan, it is a pity that I cannot make the trip to Bangkok and dedicate my cordial birthday wishes for you in person. However, despite the geographical distance between us, I have always felt very close to you because you have always been a role model in my mind. All the continuous efforts you have made, all the support you have provided, and all the writings and actions you have produced for Buddhism, for all sentient beings, for world peace, for justice, and for our environment have inspired me and encouraged me to follow your footsteps and go all out to take up the challenges posed by these urgent tasks. A respectable senior with compassion and wisdom shall be blessed with health and longevity. I pray with all my heart that, for the sake of all sentient beings, and for the lasting benefits Buddha Dharma may bring to the world, you shall stay with us and work with us all for the long years to come. May you enjoy all the blessings, merits, and longevity! I’m sending you my warmest wishes on this auspicious 80th birthday of yours. You have always been a source of inspiration and I really appreciate the engaged buddhistic thoughts and actions you’ve been manifesting throughout your life in trying to make our world a better place to live. May you enjoy excellent health, longevity and may you be able to continue serving all sentient beings in the many more years to come. Congratulations on your 80th birthday. I hope you will have many more years of creativity and troublemaking. It is not an exaggeration to say that the arc of my life curved radically since we met more than two decades ago. I am grateful for the time we have had together — in your home, in ours, and in the fields of engaged Buddhism. And I am aware that so many of my closest friends and comrades have come from your own wide circle of Buddhists, activists, and thinkers. Please take good care. WITH YOUR FAMILY AND FRIENDS AROUND YOU. Congratulations to Ajarn Sulak on your 80th birthday, and with deep appreciation and gratitude for your life of commitment to the dharma and social change, and may the seeds of wisdom and peace continue to find fertile ground and flourish. Great joy to Ajahn on this occasion. I am late in my birthday greetings! A thousand pardons! It was great to see your photo with Thay sent by Moo today. It is a great example of your kalyanamitra style as I know you have talked very directly with him about problems you see in his community from the outside. And yet he still offers you his blessings! Such paramita to stay in relationship with people and to continue the bodhisattva work of a million kalpas is the main reason I am here with INEB now in my 23rd year! It is due to your kindness and generosity over and over the years! With all great blessings and metta to you and your family on this auspicious occasion! and a cherry blossom (not a lotus) for you (attached but without attachment)! Greetings to the man who plants wisdom on his 80th birthday! May you live long and continue to plant wisdom, which is so much needed. I called yesterday with a lot of help from my youngest daughter and managed to restore my email accounts. I arrived back home in McLean and hand delivered your gift to Dawa. She reverently touched her forehead to it and it is now sitting on our shrine. I had a wonderful visit to Thailand and I am so satisfied with the time that I was able to spend with you at your home. I needed both to bounce some of my ideas but also to let some steam off. The discussions that I had with Harsha and Moo were constructive and meaningful. I will have an opportunity to continue the discussion with Harsha at Tashi’s wedding. I’m also going to try and nail down some date for our proposed dialogue with Professor Samdhong Rinpoche and you. I will be with Samdhong Rinpoche in about 10 days time in Chicago. I will call Moo when I am with Rinpoche to discuss the best time for our get together. I am quite excited about it. We are going to truly miss you at the wedding but at the same time we understand that unless you master time travel it is impossible for you to be there because of your long time commitment in NY. Anyway, I would like to be able to invite you to Gangtok, Sikkim sometime in the near future. Tashi was very touched with the wedding gift from you and Mrs. Sulak. Your Buddha image will no doubt become part of their shrine. She will write to you personally to thank you but I also told her of your kind invitation to come to Bangkok for their honeymoon. Finally could you or Moo convey my warm regards to my Sri Lankan friend Raja Dharmapala for his ordination on your birthday. With respect and love from Dawa and our youngest, who is still fortunately with us. I remember the first time we met: I was an intern, assisting, at one important conference or another. My job was to take care of important leaders. I was new, and unfamiliar, and so I asked you who you were. May you make trouble for many more years to come! Many years ago, when I was beginning my studies and advocacy in the field of people-centred development , human rights and education, I learned about your dedicated and courageous work for justice, sustainability and peace. This learning was truly inspirational and nurturing. It helped to open my mind and heart to the vital role of engaged Buddhism and spirituality in building a culture of inner and social peace. In deep gratitude for your sharing of wisdom, loving-kindness and compassion, may I send my warmest wishes for a very joyful and peaceful 80th birthday celebration! I wish you a very Happy 80th Birthday on 27 March. On this very special day, the Jungto Society Sangha and I wish you good health, longevity and happiness in countless years ahead, and in your continued spiritual journey to practice and spread the Buddha’s teaching, wisdom and loving-kindness. I will see you soon in New York! We?re living in this planet ? We?re indeed designed to live in mutual co-operation! This is how we define living beings at least a human! By living we mean that we?re not individuals, are we?! Indeed, we?re, but a collection of individuals ? Whose existence is reliability of larger intelligence! Ajarn Sulak is an individual who is the tangible quintessence ? Whose embodiment he manifests and admired around the world. In the righteous quality of teachings of Buddha ? Is indeed a blessing upon this earth! It reminded me of the life of Siddhartha the Gautama ? Risen above all individuals to embrace oneness of the humanity. Has brought about the radical transformation in him. Thus drawing him back into the inner world of spirituality. He certainly raised above all the injustices. Such was the episode in Ajarn Saluk?s trails. And then the religious and social discrimination. Into the facades of socio-cultural and religious problems. Where the teaching is an inevitable part of his action. With a sensible yet realistic approach. A ship of knowledge embarked upon the profound learning. Into the daily activities and dealings. Whose motion is the epithet of Bodhisattva?s deeds. Like dispelling the darkness out of the light of compassion. To facilitates future leadership in commencing the predicament. Especially to me and my organization in Ladakh is indeed very great! Which aim at harmonious living with nature and spirituality. Ajarn Sulak persuaded the illustrious Princess. Her Royal Highness, Kalayani Vadhana, sister of his majesty the king of Thailand to make initial donation for this project. Thus Ajarn Sulak has been important part of the one of the fast growing Buddhist NGO Mahabodhi International meditation Centre MIMC in the western Himalayas of India! Which for me is the true source peerless friendship. manifesting his rightful proclamation on True Compassion and with wisdom. May all the Buddhas and Bodhistavas shower their blessings upon Dear AJarn Sulak! May you live long with perfect health to continue your service to Buddhasana! With heartfelt admiration and congratulations on achieving eighty years of age . Your tireless efforts to uphold the Buddhist principles in all you have achieved , for the positive development of society , is an example for us all to keep going in the right direction and planting seeds of Peace. We wish you good health and happiness.